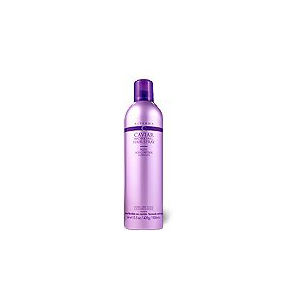 Alterna Caviar Working Hair Spray With age-Control Complex will minimize the visible signs of aging with this ultra dry flexible hold hair spray that provides long lasting style support. Infused with caviar, a rich source of omega-3 fatty acids, and nutrient activating enzymes to help maintain vital moisture levels in the hair cuticle while active organic compounds, known as plant cytokines, help stimulate protein production. Application: to mold - spray on to wet hair and shape with fingers, use with or without heat. to finish - spray evenly over hair after styling. reapply for maximum hold. Ingredients: sd alcohol 40-b, hydrofluorocarbon 152a, octylacrylamide/acrylates/butylaminoethyl methacrylate copolymer, cyclomethicone, aminomethyl propanol, phenyl trimethicone, triethyl citrate, peg/ppg-17/18 dimethicone, pentaerythrityl tetracaprylate/tetracaprate, panthenol, ppg-5-ceteth-20, ppg-2 myristyl ether propionate, propylene glycol, caviar extract, aqua, hydrolyzed soy protein, glycine max (soybean) symbiosome lysate, fennel (foeniculum vulgare) extract, pikea robusta extract, saccharomyces (lysate, copper, zinc) ferment, superoxide dismutase, lactoferrin, adenosine triphosphate, retinyl palmitate polypeptide, niacinamide polypeptide, ascorbic acid polypeptide, panthothenic acid polypeptide, phospholipids, corn oligosaccharides, copper oxidase, acetyl methionine, acetyl serine, amino acyl trna synthetase, magnesium sulfate, peptone, fragrance.